Do you have a dream bike? Maybe it's a groupo (or component) you want to build a bike around? Or a frame that you have (or have seen) that you love, but needs to get built up. This is one of our customers dream bike that he gave us permission (encouragement) to share. 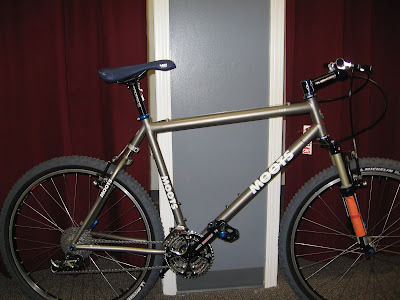 It started with a Moots frame which he loves and brought to the shop. And we have slowly cobbled it together with some parts he "Ebayed", some he had in his garage, and a bunch of new stuff that we ordered up special for him. It's not quite finished, we still have to order shifters, and decide on grips. But it's January, and he's not in a big hurry. Do you want to make that dream bike a reality? Have you been eyeing that frame on Ebay, but want some help building it up? Do you have something that's been sitting around for a long time, but want to modernize it? Well let's make your dream bike a reality. Don't forget we discount Labor Rates 20% when the snow's flying, so get in here soon, and ride your dream bike by spring.